There is a subsection of humanity that may mean well, but their dogma can all too often blind them to what needs to be done in my field of animal protection and conservation. An apparent case in point: Pembient. 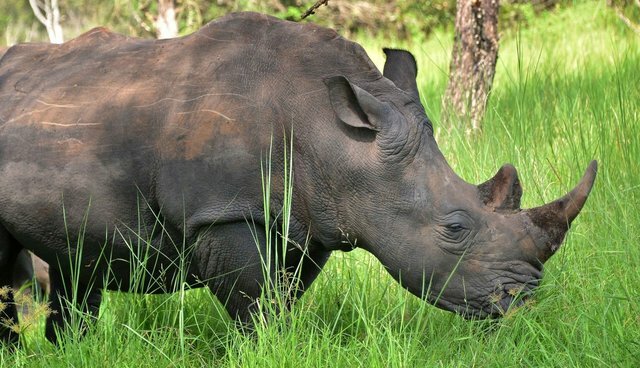 It is a company based in the state of Washington that thinks it has an idea, and a product, that will stop the poaching of rhinoceroses (all five species of which are under threat and three of which are critically endangered). But, the people who actually work to protect rhinos don't agree. Additional to the pressures of a burgeoning human population and consequent demand for land and resources, there are very specific demands in certain parts of Asia for rhino horn to be used for a number of purposes. The story is very well told in the highly recommended bookIvory, Horn and Blood: Behind the Elephant and Rhinoceros Poaching Crisis by my good friend, Ronald Orenstein (Firefly Books, 2013). Poachers don't care if they exterminate rhinos, and indeed, the Javan rhinoceros, which may be the rarest mammal in the world, must-like the remaining species-be protected from the ruthlessly deadly threat of poaching. At the retail end, rhino horn can reportedly be more valuable, gram for gram, than gold or cocaine. Pembient's high-tech "solution" is ingenious. It intends to create a replica of rhino horn through a process called "biofabrication." Essentially, Pembient wants to produce a product that is virtually biologically identical to the thing it replaces: rhino horn. The company has gone to great lengths to explain the logic behind its decision, which can be read here. The company's CEO, Matthew Markus, perhaps best summarizes Pembient's strategy to protect rhinos (and earn profits): "Simply put, if some biofabricated horns can be passed off as wild horns, then consumers won't be able to reliably determine any horn's real value and the price of rhino horn will fall." There may be a trace of validity to the argument that providing a less expensive alternative to products derived from wild animals (and plants) may work as a conservation tool if the alternative costs less to produce than the wild product. But, actually, that is not how it usually works. And, if the product costs more to produce via a method that does not remove animals from the wild-as is true of such things as bear bile and the blood, skin, and bones of tigers, which are much in demand-it certainly isn't true. On the other hand, raising tigers, or certain fish species, or parrots, or ginseng hasn't protected wild populations precisely because taking from the wild, whether by poaching, or legally under a quota system, is at least financially competitive with the alternative product. So goes the Pembient argument. Pembient also plans to insert a DNA marker that, while totally undetectable at the consumer level, would allow forensic investigators to determine synthetic rhino horn from that which was poached. And yet, my friend Susie Watts, WildAid Africa Programs Manager, mirrors my own experience when she says she can't find any conservationist who agrees that the scheme will work. She told me, "I would actually have more respect for them-not a whole lot more, mind you-if they admitted that their real goal is to make money and to attract more funding for the next hare-brained scheme. Dressing their business plan up as conservation is deeply repulsive when rhinos are being butchered every day." The reason for this antipathy for the business plan is that, while it is true that providing alternatives theoretically can work, it normally-usually-does not. And, to put it simply, that's because the choice to illegally use real rhino horn for such things as traditional medications, ornaments, recreational uses, and as a detoxifier (but not, contrary to popular lore and the Pembient webpage, as an aphrodisiac) has nothing to do with rational, logical thought processes. In other words, the market is already flooded with less expensive alternatives, and that is not saving rhinos. While those alternatives are not to be mistaken for rhino horn, if the surrogate rhino horn was out there, it would almost certainly drive up the value of the real product, as long as its provenance could be proved. And, of course, there is a line directly from the poacher through the markets to the ultimate consumer. And, there will always be people attracted to "the real thing" as a point of status. They want what they should not have-what others can't afford-and, the rarer it is, the more they want it. What the experience of conservationists has been is that supply fuels demand. What the economic theories being touted by Pembient don't grasp is that rhino horn buyers don't want something that can be used for the same purposes as rhino horn; they want rhino horn! Matt Hayward of Bangor University and William Ripple of Oregon State University have recently published research on 74 of the largest terrestrial herbivores (all with body mass of more than 100 kg), stating: "Our results are highly concerning. The vast majority of these large herbivores are declining in distribution and abundance, such that 60% are now threatened with extinction. These include well-known and iconic species such as elephants, hippos, all species of rhino, European bison, and Indian water buffalo, but also less well-known species such as takin, kouprey, mountain and lowland anoa, and tamaraw. The situation is likely to get worse and we risk leaving empty landscapes unless urgent and drastic action is undertaken." We do have a history that shows what works. While conservationists are eager to employ new ideas and new technology, we must avoid that which has failed. And, as a generality, with a few notable exceptions, driving the market for the product is not the answer.